Zacuto VCT Tripod Plate Z-VCTTP (ZVCTTP). The VCT Tripod Plate adapts any standard tripod head into a VCT-14 style tripod. Zacuto VCT PRO Baseplate. Zacuto VCT Pro Baseplate. Zacuto FS5 Grip Relocator / Sony FS5 Trigger Grip (Pro Version). Die Baseplate kann mit einer VCT14 Stativplatte (V-Wedge), oder mit 1/4" bzw 3/8“ Gewinde auf dem Stativ oder der Schnellwechselplatte montiert werden. Zacuto Universal VCT Baseplate. Das integrierte Gel-Schulterpolster ist ergonomisch geformt und gibt zusätzlichen Halt. Zacuto FS5 Trigger Grip, the Rosette Trigger Grip to relocate the Sony FS5 handgrip. Zacuto Rosette Grip Relocator (Regular Version). Zacuto VCT Tripod Plate. Zacuto VCT Pro Baseplate. Zacuto VCT PRO Baseplate. Zacuto FS5 Grip Relocator / Sony FS5 Trigger Grip (Pro Version). Zacuto VCT Tripod Plate. Zacuto Rosette Grip Relocator (Regular Version). Marke Zacuto. Embase VCT universel Portugal. Markenkompatibilität VCT 14. La plaque de base peut être avec une plaque de trépied VCT14 (V-cale), ou avec 1/4 « ou 3/8 » thread sur le trépied ou le plateau rapide est monté. ZacutoZ-FS5GR (ZFS5GR) Rosette Grip Relocator Compatible With The Sony FS5 And Varicam LT. Zacuto FS5 Grip Relocator / Sony FS5 Trigger Grip (Pro Version). Zacuto VCT PRO Baseplate. Zacuto VCT Tripod Plate. Never used Zacuto Zaffer Z-ZFFR. This is basically a genuine Manfrotto 035 Super Clamp with a Zacuto 15mm Rod Adaptor. Allows any 15mm rod item to be used with a super clamp. COMPATIBLE ZACUTO THREAD 1/2"-13. COMPATIBLE EN PAS DE VIS ZACUTO 1/2"-13. compatible avec le standard 15mm ZACUTO. Extendable Anodised Female/Female Aluminum 15mm Rods. 2 x Rod for a 15mm Rail system (12" / 30cm long). COMPATIBLE ZACUTO THREAD 1/2"-13. 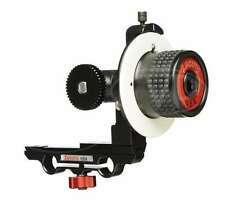 COMPATIBLE EN PAS DE VIS ZACUTO 1/2"-13. compatible avec le standard 15mm ZACUTO. Extendable Anodised Female/Female Aluminum 15mm Rods. Perfect to support any matte box or follow-focus. Todas las piezas son originales y se incluyen muchas piezas más. c300 y c500 de Canon REd Scarlet, Epic y Dragon y cualquier otra cámara de cine digital o cámaras DSRL. Indie Baseplate Kit. rods, Minimount, 10" Rod Extensions, T-slide Kit, Zred. The Zacuto Mini Baseplate (Z-M-UB) is a smaller version of the Zacuto Universal Baseplate (Z-UB3). Designed and manufactured by Zacuto. Made in the USA. Zacuto Z-M-UB Mini Baseplate with 8in Rods. Zacuto USA. Zacuto Flippable Reversible Z-Focus followfocus for 15mm rods - Z-FF-1-FR (ZFF1FR). The white disk allows the focus puller to create distance marks for repeatable focus pulls. This Z-Focus has a new flippable design so you can quickly remove the follow focus and flip it from the operator to the assistant side in seconds. The 15mm Studio MiniMount slides onto a set of 15mm studio spaced rods to act as a brace between rods or to create a simple rod or articulating arm mount. The center of a MiniMount has a 3/8 16 screw hole for a Noga or Israeli arm. 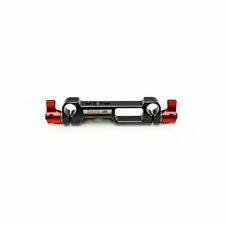 Zacuto Z-UB3 Universal Base plate 3 v3 for DSLR & Camcorder, supports 15mm rods. (Zacuto Gorilla Baseplate (Model # Z-CGB) plus 2) 15mm Rods. Condition is Used. Works great. NOTE: the front rod mounts are screw-in only (see video link below). Thirteen Zacuto Assorted Spare Parts. They are all used. Sold AS IS. Baseplate (unsure exact model). Miscellaneous Parts(not sure of ) If you see it pictured, its included. If you would like to use your own account number that can be arranged. The Zacuto Z-QR is a connection accessory for support systems using parallel rods.This quick release system can quickly be adapted to rods underneath the support and on front of the system. This is a single 13" Zacuto ZGrip. Nothing else included. •ZGrip Mount. •Red Plate w/Vmount adaptor. •Mounting Bracket (goes on Red Plate). little or no communication among other things. THEY ARE JUST MOVING PRODUCT TO GET A HIGHER SALES SCORE. Zacuto USA. The Zacuto Z-RE-F1 is a rod extension. This extension has a female threaded connection on one end and no thread on the other end. 1" Female/Non threaded. 1 Rod Extension Only. The hotshoe is in perfect working condition. •Z-MM1 Mini Mount. •ZGrip Mount. This is a single Zauto Z-MM1. Nothing else included. •Short Rods. little or no communication among other things. THEY ARE JUST MOVING PRODUCT TO GET A HIGHER SALES SCORE. The DSLR baseplate is Zacuto's adjustable and expandable baseplate. The baseplate has multiple ½" 13 threads on all sides; (1) ½" 13 thread on both the left and right side, (4) ½" 13 threads on the front (2 on the top and 2 on the bottom) and (2) ½" 13 threads on the back. No longer need it, and now it can be yours. The grip has a great feel in your hand, the lock is solid, and easily loosened allowing to reposition, right where you need it. Adjustable and expandable base plate. Removable quick plate. Lightly used. May show a few scratches but in great shape. Zacuto Z-1420 Overview. TheZacuto Z-1420 is an accessory for the Zicromount III. Flash & Lighting. Computers & Accesories. Binoculars & Spotting Scopes. Batteries & Power. Bags & Cases. Albums & Storage. •ZGrip Mount. This is the bracket that mounts onto a MiniMount. Bolts are included. •Mounting Bracket (goes on Red Plate). little or no communication among other things. THEY ARE JUST MOVING PRODUCT TO GET A HIGHER SALES SCORE. The Zacuto Z-MM1 MiniMount is a universal 15mm rod mount. The MiniMount can be adapted to work with many accessories by adding a Zround Mount. Three Zacuto Z-MM1 MiniMounts that are in used condition.There are NO Red Locks on any of the mounts.